Low-income neighborhoods designated as Opportunity Zones by the Trump administration have seen a rapid surge in home sale prices, according to Zillow. Opportunity Zones are part of a contentious program passed by Congress through the Tax Cuts and Jobs Act of 2017 in an effort to encourage investment in low-income communities through tax breaks to developers. Investors who build in those areas can get a tax break of up to 15 percent over 10 years. 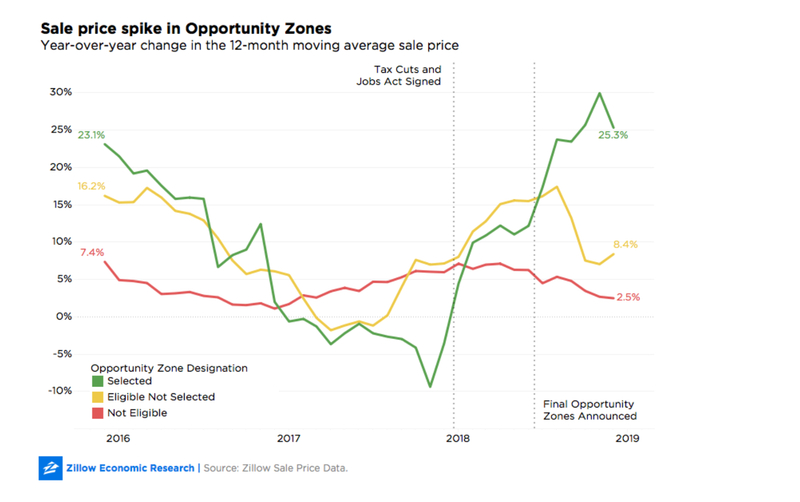 Zillow found that the 8,700 designated ‘Opportunity Zones’ across the country have seen their home sale prices rise by over 20 percent over the last year — a concern some activists expessed back in 2017. Meanwhile, areas that have been eligible but not selected for the program saw a slowdown in their sale price growth. Still, it is unclear whether the local program will benefit local residents as much as wealthy investors — at the time it passed, many argued that it would lead to gentrification and push poor people out of their neighborhoods. Others have argued that the program benefits neighborhoods that are already undergoing development or are even considered to be expensive — for example, New York’s Brooklyn Heights neighborhood. Another concern was that the program has no requirement that the developments benefit the community. As expected, banks, private equity firms and other investors did not miss a chance to begin flocking to Opportunity Zones, which include New York’s Astoria and Boston’s Charlestown. Zillow also released a ranking showing which zones were most likely to see the most investment. Brooklyn Heights in NYC, Wayne State in Detroit and Treme’ Lafitte in New Orleans have topped the list. “What’s clear in the meantime is that among the vast array of neighborhoods selected as Opportunity Zones we’ve witnessed wildly different housing market trends up to this point, which might hint at the future of these communities,” Casey said. Article image credited to Nick Ares/Flickr.